“Aren’t we lucky?” said the lady who finished today’s parkrun at Whitley Bay around the same time as me as we walked away from the hubbub of the finish line. And today, under bright blue autumn skies with the sun on my face and the sound of the waves in my ears I did feel very fortunate indeed. Here in the north east, we’re lucky enough to have a great number of parkruns from Middlesbrough through to Sunderland, Gateshead, Newcastle and right on up to the new route at Druridge Bay. My home run is actually Newcastle, although geographically, Whitley Bay is my closest. It’s close enough to allow me to run there and back, should I fancy a long run and take it steady, which is what I opted to do today. I gave myself plenty of time to jog along to get there, so I’d had a really good warm up, before I huddled among the gathered runners ready for the start. The sun was in our eyes as we negotiated the first few twists and turns along the course and the number of runners helped make sure I kept my starting pace steady. Once down onto the lovely flat promenade, we start to spread out and it’s easier to dodge past a few runners, or to be overtaken myself. I’m going easy today, it just feels nice to be out for a run. At every turn or junction there’s a smiling marshal and a small chorus of thank yous from runners like me who have the breath to utter them. Off the prom and up the small rise, I pick up my feet and use my arms to power up the incline, then cruise down the yellow stone path and over the bridge, before the second climb back up and round towards the road. I watch my feet over the cracked tarmac along the top path, heading back round towards the skate park and up another little rise to circle around the first lap. Along the prom for the second time and the fastest runners have already crossed the finish line. How I wish I had their speed! But I’m feeling good, just enjoying being out in the fresh air today, and I start to catch a few runners in front of me. Reeling them in, slowly, one by one takes my mind off my legs which are starting to ache now and as I increase my pace, my breathing gets heavier and louder. Still here I am again, about to climb the small set of rises and head back round to the road. Out of the corner of my eye, I see a lady running with a bright red buggy. That must be hard work up that hill! By the time I’ve made it down onto the promenade for the final stretch, she’s caught and overtaken me, inspiring me to put a bit of a spurt on in the last few hundred metres and finish with a sprint. Out of breath, I collect my token and walk over to get my barcode scanned. Hazel who takes my token from me, says “I like your blog”, which is a really nice surprise and makes me smile. I’m very lucky that I found running as a means to keep fit back in 2008, and that parkrun has helped me maintain and build on that fitness. I’ve used the regular weekly run as part of my training for races like the Great North Run or the triathlons I do through the summer. 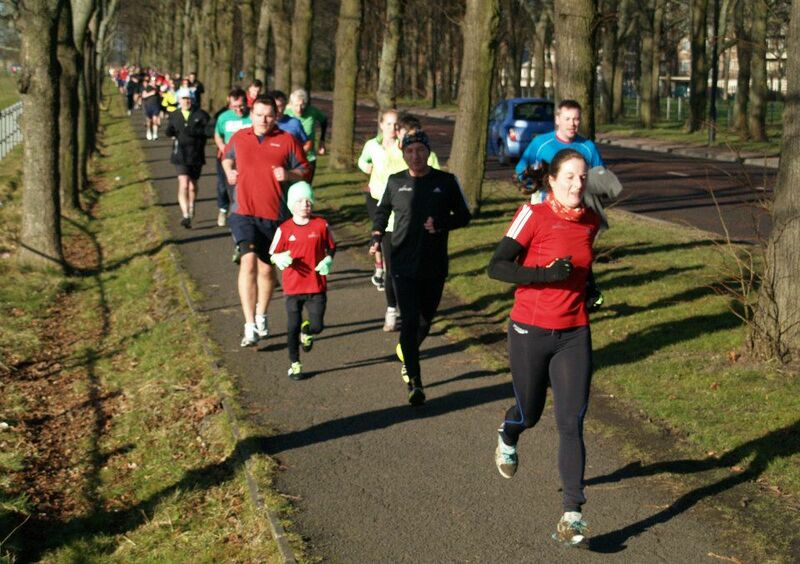 But more importantly, parkrun has introduced me to volunteering and to new friends. I do enjoy running, and am currently chasing down my 100th parkrun, but I really enjoy volunteering too. It’s fun to see parkrun from the other side, to appreciate how it works and to see all the runners from the fastest to the slowest, the old to the young all taking part. My time today wasn’t my fastest, but parkrun isn’t always about being speedy. It really is for everyone and I think you see that as a volunteer. So, yes, I do feel lucky to have a free, weekly, timed 5k run as a motivation to get up and out and get moving all year round. Lucky to be able to run along some of the finest north east coastline. And lucky to have the incredible support of the volunteers who make parkrun happen week in, week out all over the UK and beyond. Remember Tony the Fridge? The guy who ran the Great North Run route 30 times with a fridge on his back? He was back with another crazy challenge, this time running for 24 hours with an even heavier fridge along Newcastle and Gateshead Quayside to raise money for the Sir Bobby Robson Foundation. My best work buddy was leaving and having drinks in town. So I dashed out for a couple of hours in the bar, wishing her well and left just after 9pm, via a superhero costume change into my running gear and headed down to race HQ. Tony’s run had started much earlier, live on local TV at 18:20. The hullabaloo of press attention had gone, and it was dark, but he was still supported by his faithful crew and other runners turning up to clock up a few miles. I arrived just as he was coming in for a pitstop and shortly after set off to run a few laps. He didn’t seem quite his usual self, or not as I’ve known him when I ran with him before. He was still philosophising, still talking about being in the moment, but there was an effort of will to it. Tony never talks in negatives and has the strongest mental will I’ve ever encountered, and that was still there, but there was a subtle down beat note that seemed off key. I was a bit worried that this was how things were early on in his run. I chatted a little with him and some of the other runners, but I sensed it was a good time for quiet focus. It was a beautiful night. After gales and storms, it was perfectly still, dark, and peaceful. The backdrop of the Tyne, with the bridges and buildings, is a sight to gladden any heart and this night it put on its kindest face. There’s a little bit of magic about Tony. Beautiful things happen when he’s around, like the sun coming up as we ran onto the Tyne bridge during his 30 day Great North Run challenge. That night, the river – the great big heart of this amazing city – provided a scene of wonder. The river was still as glass. As we ran alongside, we stopped and looked over the railings to see a perfect reflection of the Tyne bridge. The world turned upside down, lights shining in the water. The ever moving river stilled in tribute to a man who just has to keep moving for 24 hours. I ran a couple of very steady miles and then left him to plough on through the night, feeling the dull ache of the run in my hips and legs, not daring to imagine how much Tony would be hurting. I woke early on Saturday morning and went to parkrun on the Town Moor where I had an unexpectedly fast run and took almost a minute off last week’s time, scoring a new season’s best and getting closer to my best ever pace time. After parkrun I returned to the Quayside to run another three miles with Tony. The sun was shining, buckets were shaken, horns tooted and Tony was surrounded by runners he knows. He posed for pictures with supporters, passers by and even with a couple who were getting married at the Baltic. He was very much more himself and after my laps, I left knowing he was in great shape to complete his 24 hour run. I have 5 weeks to go until my first race of the season (a 10k) and I have no idea about what kind of running form I’m in. With one thing and another, I haven’t really settled into a consistent training routine this year which unsettles my head a bit. But, on the positive side, I’ve kept ticking over and done some okay mileage, and more importantly, I’m not recovering from injury like I was at this time last year. Fingers and everything else crossed, but it looks like my plantar fasciitis and other bio-mechanical niggles are behaving (please don’t let that be the curse of death). I was hoping to get out and do a fast blast at Newcastle parkrun this weekend, but a covering of snow, snow falling during the run and still slightly recovering from my cold, meant I had to dial back expectations. I still ran quite hard, given the conditions, and was happy to be within about 90s of my best time this year (run in very different conditions). A few more parkruns should give me a feel for what I can come up with on race day. In a way, the running really just has to look after itself. I guess it just feels a bit different, that there isn’t a big run only event looming later in the year. No half marathons for me in 2013. Just a big old standard tri – and if I can find the right event, maybe 2 standard distance events. One thing I have changed is my running style. After spraining my ankle in October, I took the opportunity to retrain myself with a walk to run plan and move to a more midfoot strike. The initial impetus was to try and run more efficiently. So I ran for a while with a shorter stride and faster cadence, trying to land lightly. But it was only when I really went back to basics, adding in running drills and going back to walk run, that I really made the changes. Some good strengthening work and stretching helped overcome the initial tight calves and I still need to work on mobility in my toes. But I’d be lying if I didn’t also hope that the change in style will make me faster eventually too. This weekend was the first time that I’d been able to actually see that change in running style for myself. There’s always been a bit of a nagging doubt at the back of my mind that changing my stride may have messed about with my running and just developed new bad habits. I went to Sweatshop in the MetroCentre to try out some new trainers. It’s a good place to go, as the sales staff are runners and they have all sorts of kit to help you test out your running style, including a treadmill where you can film your feet and see how you run in slow motion. When I ran, I could see I looked nice and straight with no wobbly ankles and I was definitely midfoot landing rather than heel striking. There were lots of people waiting to be assessed when I got there, but everyone got great service from the staff, and I was very happy to have Niyc Pidgeon, who I know from Newcastle parkrun, helping me choose a new pair of running shoes. I tried loads of different trainers, including the Nike free (towards a barefoot shoe) and some Asics racers in a stunning orange and purple. It was great to be able to compare and contrast different makes and styles so closely together. I reckon I could have run in any of them, but there a few subtle differences. Some felt wide at the front, so my feet shifted more from side to side. Others were loose at the heel, and tightening the laces to get them to a better grip put a bit more pressure on the top of my foot than I liked. I was going purely on a research trip, but with some vouchers burning a hole in my pocket and a generous parkrun discount, I came away with a pair of New Balance 1080s. Lighter cushioning than my current Asics Nimbus, but still not really a minimal or racer. I’ll be weaning myself into them over the next few weeks and hoping we’ll be ready for our race debut together at the North Tyneside 10k at the end of March. I’m still thinking about the Nike frees, which I really liked too, but I’d have to move into even more gradually. But they were the only barefoot style I tried and they were pink (there are places I will not go and pink is one). I’d like to try a few more barefoot/minimal trainers and maybe think about them as a second/short race pair. But I’m laughing at myself as a total shoe agnostic. I don’t seem to have settled on a favourite brand. I started in Nike Pegasus (I still have a pair that I wear in the gym); I made a bit of an error with Saucony (too stiff and rigid for me, and I went through the toe within a month of wearing them); loved my Asics Nimbus (the shoes I ran all my 2011 PBs with before I bought another pair which saw me round the Olympic park and another Great North Run). And now I’m in New Balance and flirting with barefoots on the side. So from saying that running needs to take care of itself, I’ve actually spent a good bit of time thinking about it . But that’s helped me work out something that I can also apply to another aspect of my triathlon training. Changing my run style wasn’t easy and it felt awkward and unnatural and frustrating at first, but I stuck with it and now it’s second nature. In fact, I can’t imagine running any other way now. Just like the swim drills that should improve my stroke technique (and there’s lots to improve). They feel strange, they upset my natural rhythm and I have to think about what I’m doing when I try them. But, like changing my run style, I’ll get the results I’m looking for if I stick with them and look for long term, rather than short term progress. I have 9 weeks until my first sprint tri – plenty of time to keep working and improving. Oh, and in case you’re wondering, no one from Sweatshop or any of the shoe brands asked me to write about them in this blog. But I’d happily recommend Sweatshop if you’re looking for advice and running shoes.